Be the first to share your favorite memory, photo or story of Iona. This memorial page is dedicated for family, friends and future generations to celebrate the life of their loved one. Iona L. Lenning, age 91, of Ames, passed away on November 27, 2018 at Accura Healthcare of Ames. Friends may call from 5-7:00 P.M. on Thursday, November 29, 2018 at the Adams Funeral Home in Ames. Funeral service will be held at 10:30 A.M. on Friday, November 30, 2018 at Bethesda Lutheran Church in Ames. Burial will be in the Ames Municipal Cemetery. In lieu of flowers, memorial contributions may be directed to Bethesda Lutheran Church. Funeral arrangements are under the direction of the Adams Funeral Home and online condolences may be left for the family at www.adamssoderstrum.com. Born on March 24, 1927, on a farm near Story City, Iowa, Iona was the daughter of Miles and Jeanette (Wierson) Thorson. She graduated from Story City High School in 1945. Iona was united in marriage to Jerral “Jerry” Lenning on September 28, 1946 at Immanual Lutheran Church in Story City. Iona worked in the Lunch Program in the Ames School District. 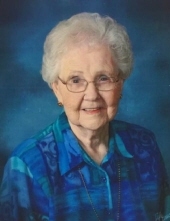 She was a member of Bethesda Lutheran Church where she assisted in church circles. Iona enjoyed playing cards and going to coffee club. She lived for her family, and supported all of her children, grandchildren, and great-grandchildren’s activities. Iona is survived by her daughters: Sheryl Corwin of Ankeny, Debbie (Lynn) Ballard of Cedar Rapids, Colleen (Steve) Grover of Waterloo; a son-in-law, Steve Clark of Ohio; six grandchildren; and nine great-grandchildren. She was preceded in death by her parents; her husband, Jerry; a daughter, Laura Jean Clark; a grandson, Jeramie Grover; a son-in-law, Don Corwin; her sisters: Maxine (Milo) Hovick and Mazel (Don) Johnson; and her brothers: Jeffery (Betty) Thorson, Onel (Leora) Thorson, and Arle (Pat) Thorson. To send flowers or a remembrance gift to the family of Iona L. Lenning, please visit our Tribute Store. "Email Address" would like to share the life celebration of Iona L. Lenning. Click on the "link" to go to share a favorite memory or leave a condolence message for the family.